Bicolor Christisonia is a rare parasitic plant from Nilgiri hills, probably chiefly parasitic on Acanthaceae like Strobilanthus. 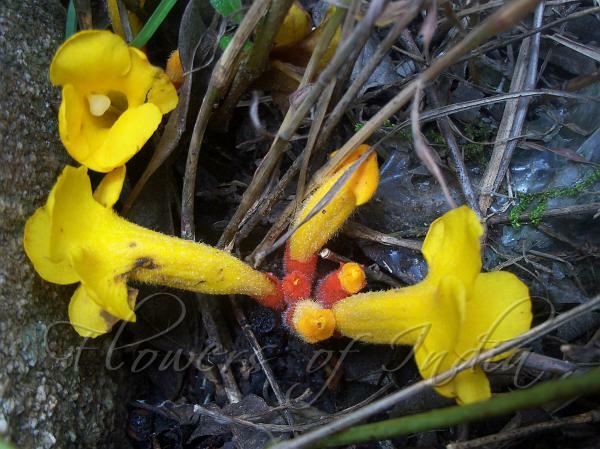 It is a fleshy plant with thick brownish yellow scaly stem, orange coloured calyx and yellow flowers. Stem is 8-12 cm long, pubescent, scales few, distant. Flowers and the flower clusters are stalked, bracteoles 2, 8 x 3 mm, lanceshaped, pointed, velvety. Calyx is 1.8 cm long, brick-red, lobes short, triangular, long-pointed, glandular hairy. Flowers are 6 cm long, tube narrow below, widening above, lobes yellow, orbicular, glandular hairy. Filaments are 2.5 cm long, sterile, anther lobes 3 mm long, spur-like, acuminate; placenta lobed; style to 4.5 cm long, stigma peltate with a large pit at centre. 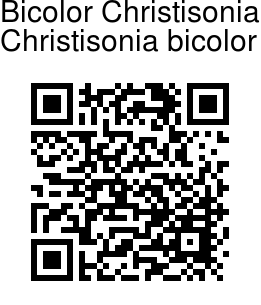 Bicolor Christisonia is found in Karnataka, Kerala, Tamil Nadu and Sri Lanka. Photographed in Velliangiri hills, Tamil Nadu.